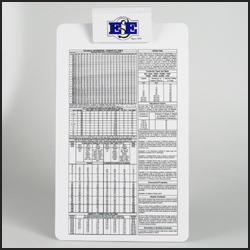 This legal size clipboard with 4" clip holds a standard legal 8 1/2" x 14" pad or an 8 1/2" x 11" pad which leaves a 2 1/2" imprint area on the bottom on the board. Product Size: 9 1/8" x 15 7/8" x 1/8"
Front Board Imprint Area: 8 5/8" x 12 3/4"
Back Board Imprint Area: 8 5/8" x 14 1/2"
Actual Carton Weight: 22.00 lbs. Minimum order is 50 units with a $50.00 less than minumum charge.